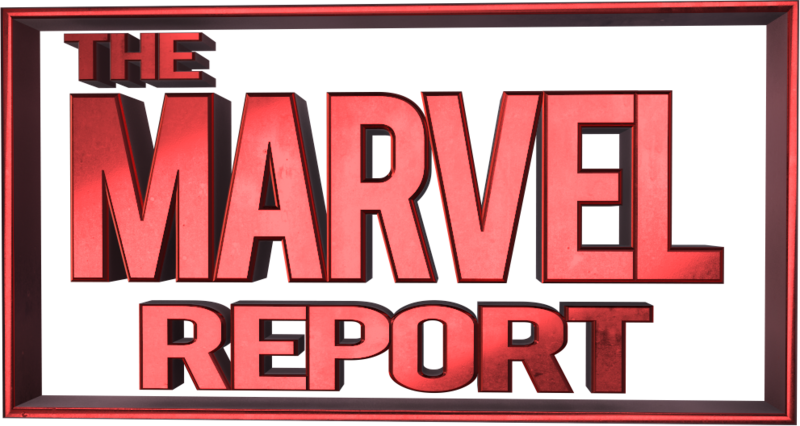 With Tony Stark missing, his company is in danger of being stolen from out of Amanda and Mary Jane’s hands and given to vultures. Thankfully(?) Victor Von Doom and Riri Williams are on the case in Invincible Iron Man #595. Plot: Stark Industries goons are removing corporate equipment from Riri’s garage, while she and Victor and none the wiser to Tony’s whereabouts at the start of Invincible Iron Man #595. But with her mother’s help, Riri sends the hired goons away and buys them a little more time for their search. Meanwhile, Tony dreams of reuniting with his biological mother Amanda – not to mention Mary Jane in an absurdly skimpy outfit the likes of which she hasn’t worn in years. Story: With Brian Michael Bendis in charge of the story for both Infamous Iron Man and Invincible Iron Man, the transition to sharing one title has been a smooth one in terms of story. It does feel somewhat crowded, though, seeing as we have two Iron People on the hunt for a third and therefore have to share three different POVs in a single issue. 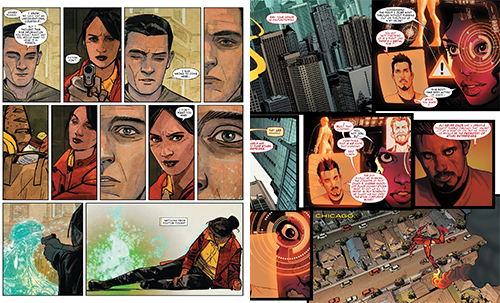 Despite this, Bendis manages to give each major character a moment to themselves that furthers their personal or emotional arcs – Victor and Amara’s ‘unconventional courtship’ now involves a gun, Riri makes a cute new friend, and even Tony dreams of what his heart most desires. As you may or may not be able to tell by this description, Invincible Iron Man #595 treads a lot of water when it comes to plot, but it makes up for the lack of progression by incorporating a lot of heart. More layers are revealed with each side story, especially for Riri and Tony. In one of her first interactions with an interested boy, we learn that tech genius Riri gets just as flustered as anyone else when face with the prospect of romance – and in her quick team up with her mother, we learn just how formidable the Williams ladies can be together. At the same time, Tony’s wish to belong once again – whether it’s as a loving son or a beloved superhero with a whole host of people behind him – rockets to the forefont in a heartbreaking sequence that reminds us of how far he was from goals before the coma. As someone who didn’t keep up with Infamous Iron Man, the Victor sequences were a little more opaque to me, but I am sure they furthered his individual story as much as the others did theirs. Regardless, the only real plot progression comes from Amanda and Friday taking the simplest possible question to A.I. Tony – and it doesn’t occur until the final page. Art: Stefano Caselli and Alex Maleev each have a unique an interesting art style that works perfectly for their respective characters. However, meshing Maleev’s more surreal lines with Caselli’s more defined ones has proven to be a little more difficult. 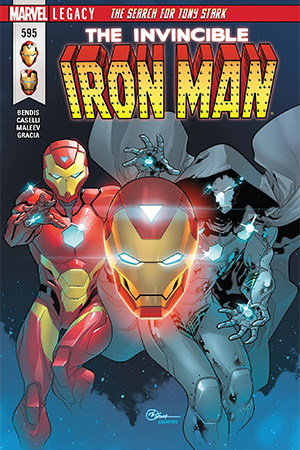 Invincible Iron Man #595 allows each world to exist alongside the other, with one page shading in Doom’s world while the next returns to the crisp Chicago streets for Riri’s. While this creates a sense of whiplash, it also gives readers the opportunity to view the full range of both artists’ talents without compromising Marte Gracia’s richer and darker color palette. Verdict: Invincible Iron Man #595 provides some great character, but there is much less searching for Tony Stark than was previously advertised. While the story is probably gearing up for a big #600, it’s a shame that the plot must be slowed down so much beforehand to accommodate it.